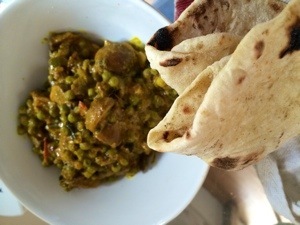 Home › Lunches › Mushrooms and peas ‘curry?’ Give peas a chance! 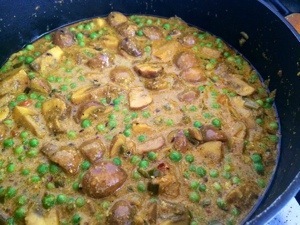 Mushrooms and peas ‘curry?’ Give peas a chance! Inspired by a post in the confusedbachwari’s site, I just had to make this dish ..
We like peas.. I remember when Mrs Fitz first came to England from the emerald isles.. She wouldn’t go near them! Father Fitz made her have just one solitary pea one day.. It changed it forever! This is a vegetarian dish.. WHAT??? Yes sireee it’s a vege dish.. I kinda had to go along with thinking what would make this a winner.. And it won a gold this afternoon. 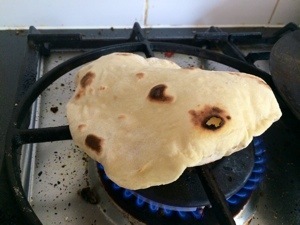 First fry cumin seeds till they pop.. Mine didn’t? Add the onion and ginger.. Let that get it’s groove on..
Add chilli, garlic and a chopped tommy.. now get the spices together . Garlic and coriander seasoning with a hit of mango powder.. A pinch of madras powder (I was watching the excellent rick stein india show at the same time!) .. 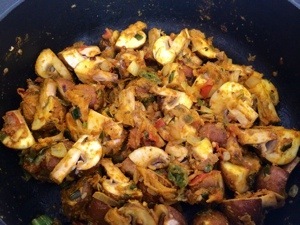 Ground pepper was added also..
Then the chopped mushrooms.. Let that all meld together for a while.. Adding the yogurt and water..
Let that boil up and look like it’s going to split! 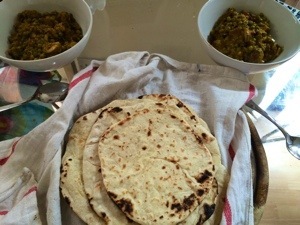 Then add the frozen petit pois ..
Let it all cook down till you are happy with the consistency..
Flatbreads .. But of course! 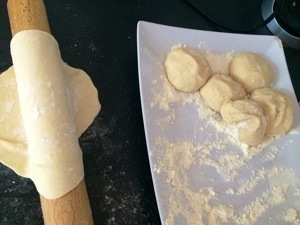 These ones are made simply..
Two cups of plain /ap flour..
Two thirds of a cup of water.. And a quarter cup of yoghurt .. to use it up! A teaspoon of baking powder and a half tea spoon of Himalayan rock salt.. This was really gloopy!! Like way too gloopy! 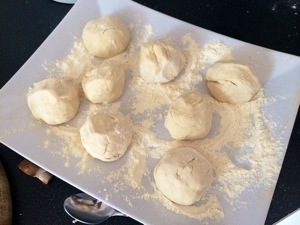 Had to add flour.. then left them to prove a little..
Rolling them out and cooking them on the iron pan.. Hitting them onto the open flame to puff up.. Wrapping them in a tea towel to keep warm.. This was indeed a great dish.. I will make it again.. Yet can I remember the exact ingredients ? Nah.. Yet that’s had fun of the fair right ? Thanks confusedbachwari’s ! Happy FF !! 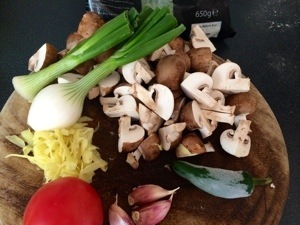 The bread looks really good and does the mushroom and peas curry. A lovely meal, indeed! It wax a lovely curry! I am sure that what Lennon meant… No? Can you hear us, Confused Bawarchis? All we’re saying is give peas a chance….. Now that’s stuck in my head. Just give peas a chance.. Am sure that was what Lennon meant .. When I first saw this it immediately went on my short list. 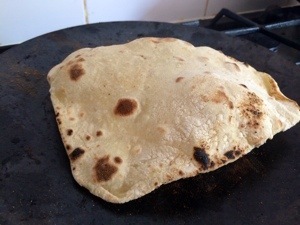 Love it with your flat bread.